ReqCycle can define data models to classify requirements in scopes (team organization) and in types (list of attributes) like "functional requirements", "safety requirements", and more. ReqCycle can create requirements, import/update or reference textual requirements existing in different data sources or formats such as ReqIF (.reqIf), OpenOffice Writer (.odt) , Microsoft Word™(.docx), openOffice Calc (.ods) or Microsoft Excel™(.xslx). It can also reference requirements contained in EMF models through usage of OCL rules to identify requirements. ReqCycle can display all imported/referenced/created requirements into treeview or tables and filter them with custom criteria on requirements attributes and values. ReqCycle can define traceability link types from requirement to a model element or code, provide associated semantics to the links and attributes (for instance "lifecycle" attribute to manage requirement validation or "rationale" attribute in case of "satisfy" semantics). The requirement can be restricted to a given scope or structure and the model element can be restricted to a specific metaclass/concept. ReqCycle can create traceability links between requirements and UML/SysML Papyrus models or Java™ code according to the traceability link types defined in preferences. ReqCycle provides extension points to create traceability to other models, code or other artefacts. 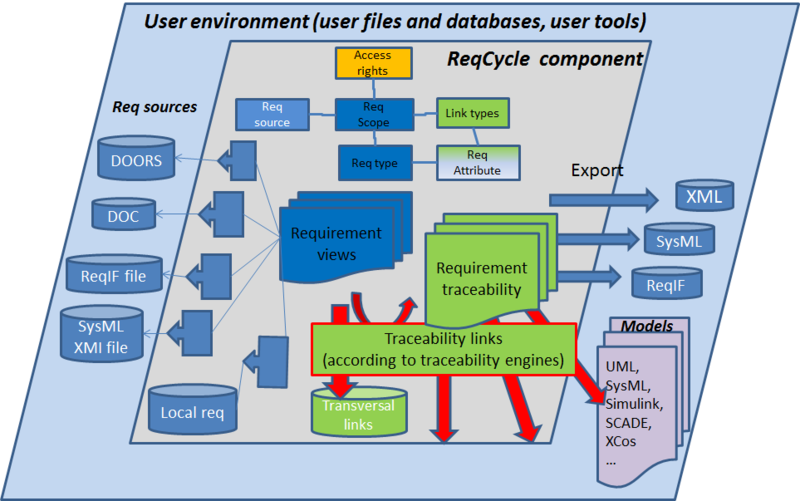 ReqCycle can capture existing traceability links coming from different sources like SysML models or Java code. ReqCycle can display all traceability links (created or captured) into a treeview or a table and filter links with custom criteria. The framework can be extended to add new requirement import connectors, new traceability analysis engines, new artefacts to take into account as link targets.